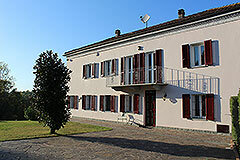 Wonderful Country House in the Asti region of Piemonte. Montegrosso Near Nizza Monferrato, Asti & Alba (ref: 6805)- Restored country home with beautiful grounds and views over the countryside and mountains.. Piedmont Properties in Piemonte. Property for sale Langhe and Piemonte. Map for Property ref: 6805, Wonderful Country House in the Asti region of Piemonte. - Restored country home with beautiful grounds and views over the countryside and mountains.